Soltaniyeh is a small city of 6000 inhabitants in northwestern Iran, the capital of the Soltaniyeh district in Zanjan province, in the Azerbaijan region of Iran. Soltaniyeh was the former capital of the Mongol Ilkhanid dynasty. 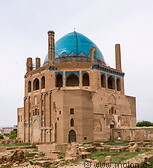 The main tourist attraction is the Dome of Soltaniyeh, i.e. the mausoleum of Ilkhan Öljeitü, which was erected between 1302 and 1312 AD. It's one of the largest brick domes in the world, and the third largest dome after the domes of Florence cathedral and Hagia Sophia in Istanbul. The dome is covered with turquoise tiles and has been a UNESCO world heritage site since 2005.